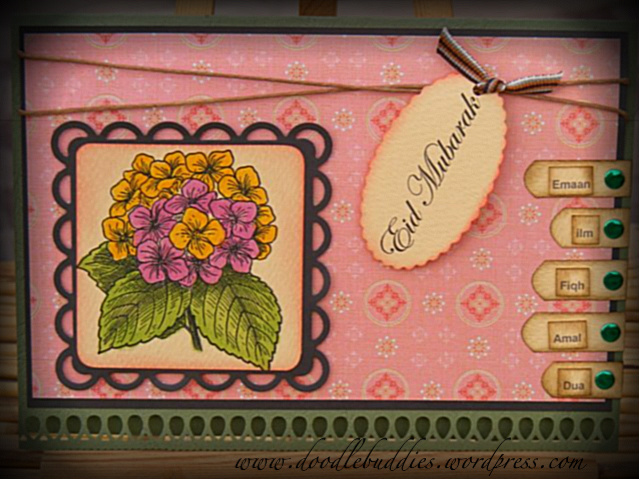 And so finally, here we are at the third and final card that I designed for Eid. 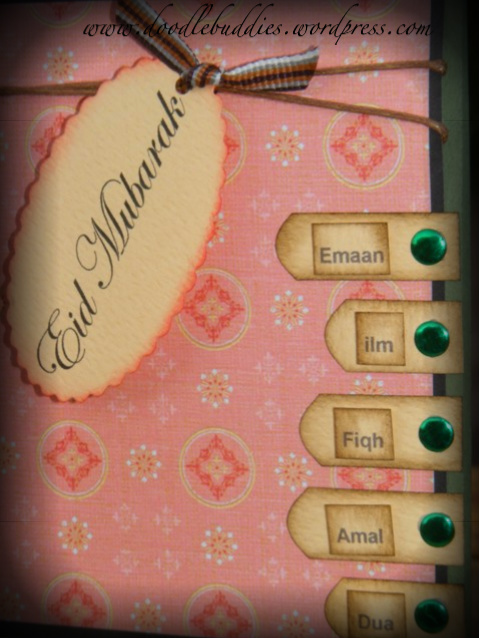 To know briefly about Eid, follow here. About the card :- Lots of elements in this one, included some border punches, two diecuts one of which is presented as a tag with the sentiment on it, brads, ribbons, and twine. The flower stamp is digital. The sentiment is by yours truly. Hope you guys like this one too. These words below paper pieced words are arabic, meaning: Faith, knowledge, practise, prayer, deeds. They are a reminder of what we should hold onto to keep life simple, uncomplicated and a source of inspiration to others. Hanna and Friends ~ Ribbons, flower, brads. Pink Link up party at Yolies. Thank you for visiting me today. I hope you will return again. Till then, stay safe and keep having fun with creativity ! 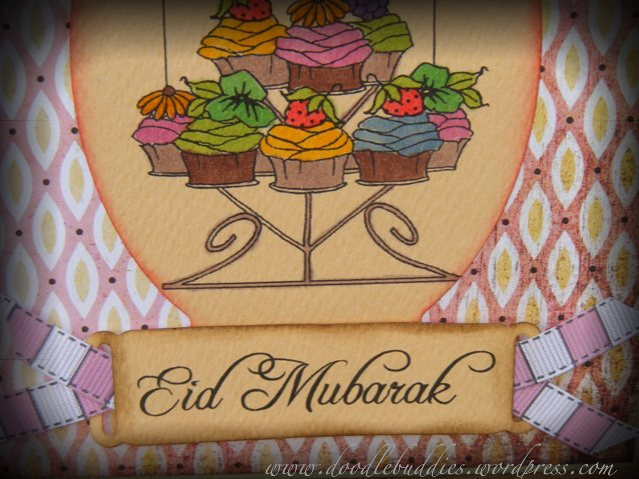 Dear friends, thank so much for all your lovely comments to my previous post on Eid Greetings1. 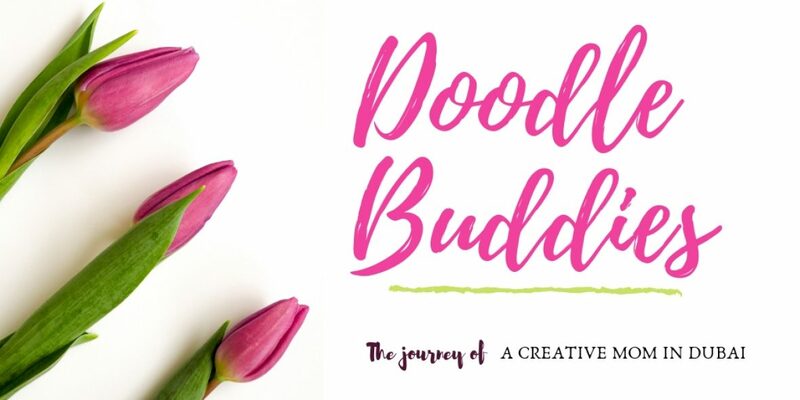 Truth be told, I have been so busy with several gift packaging orders and altered art projects that card making has just not been much focused upon. I go thru these “waves” when suddenly I get inspired to a certain craft and take to it like a fish to water ! Say for instance, last entire month, I have been designing party favors and gift baskets, then for months before that, I was so engrossed and enjoying altering plaques and before that, it was bookmarks and paper crafting !! Its a weird thing with me 😉 but I suppose, there must be “others” weird like me who also find a certain craft style so enchanting that they just have to try it and once they try it, they are hooked onto it ! 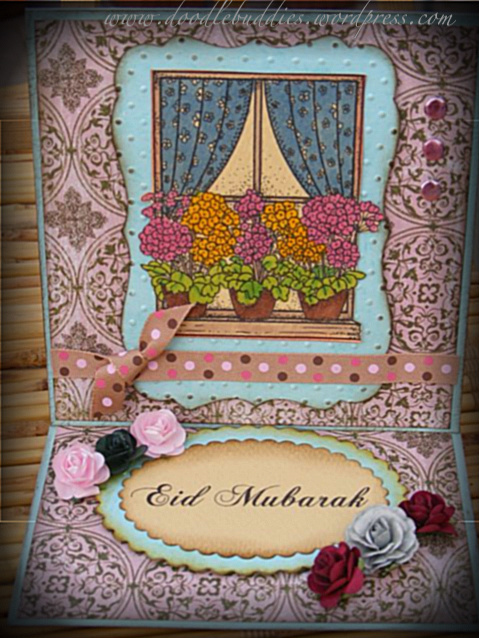 So anyways, I think, the only greeting cards, I have made in a while are these three Eid greetings. Alittle about the card, It is a simple yet elegant card with a bit of paper piecing for the “sentiment over the cupcakes, some diecuts/punches and a bunting on it. Needless to say, I love the pink pattern paper ~ Pink being my very favorite of colors ! Ofcourse the cupcakes are digital stamps while the sentiment is done by yours truly on microsoft word. A little ribbon and we are off with a pretty card. I have actually stopped saying that I have distressed the edges becoz I dont think, I have done ANY projects WITHOUT distress ink in the past couple of years !!!! I am virtually addict to it. 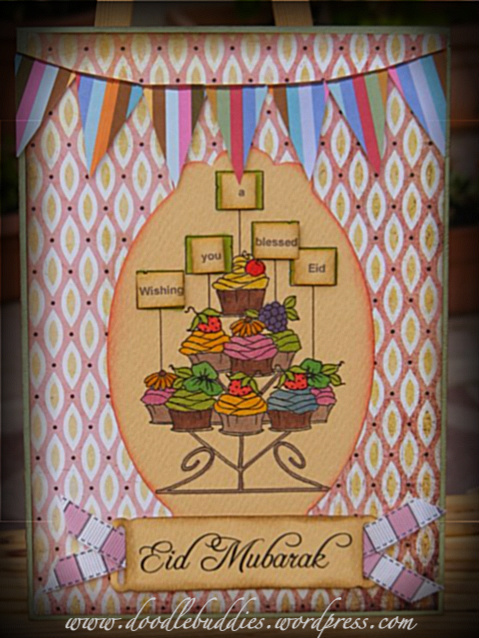 So please do share with me how you found my Eid Greeting card.